I’ve been sitting on this post for several months. I first began to write it after a conversation with some friends from church. We were talking about our spiritual journeys, and mine was pretty uninteresting: I was raised in the church, I followed the rules, and I never needed to learn the hard way. I always did what was expected of me, and I liked being the good girl. I relished the reputation. That’s not to say I haven’t made mistakes, because I have made plenty. But I never had a rebellious phase. I never felt the urge to see what I was missing, or cross any lines. “Rebellious” just wasn’t my thing. I have thought about that conversation a lot, because my initial reaction was to push back. I know myself well enough to know that’s not my style. Mostly because I like to be liked so much. People-pleasing is almost like a guardrail in my life. Rebellion is too risky for someone like me. Most of my life has been a rebellious phase. I first awakened to this reality after listening to a sermon by Tim Keller. In it, he talks about Romans 7 and the life of Paul. Like me, Paul was a rule follower. He lived and died by the law, which is why he never had a “rebellious phase” either. Paul was the guy tattle-telling on the rebels. Paul was “good” in his own eyes, but in Romans 7 he sees his life through a new lens. What he sees, is rebellion. Paul’s struggle was the latter. Rather than rebel against the Law, he used the Law to rebel against God. Deep down he didn’t want God’s grace. Or at the very least, he didn’t think he needed it. As long as he could check off a list of rules, he could still be in control. And so the thing that was meant to draw Paul to God, ended up standing between him and God. It’s hard not to see myself in that story. For so long, grace has been hard for me to grasp because I’ve always been a good kid. I knew in my head that I needed grace, but my brokenness wasn’t that evident. It was mostly head knowledge. Over the weekend, our teaching pastor preached on Luke 15 and the Parable of the Prodigal Son, and once again, I recognized myself in the story. The parable features a rebellious kid and a good kid. One obeyed his father, the other revolted. One stayed home, the other left. In his indignation, the older brother–the rule follower, the “good” boy–refuses to go in and celebrate, and puts himself outside his father’s house. His self-righteousness has the same result as his brother’s rebellion. Both boys put themselves outside their father’s house. Both rejected their father, though in totally different ways. Here’s why I think this is so important. The first kind of rebellion is easy to spot, and its destruction more apparent. That means it’s easier to know you’re lost, and easier to name the solution. The second kind of rebellion is trickier, because it doesn’t look like rebellion at all. You think you’re good with God, that you’re living the life He called you to live, but deep down you’re still rebelling. Your soul is founded on the sandy terrain of your own strength, and eventually it will begin to crumble. But with this second form of rebellion, you might not know why you’re crumbling. After all, you’re a good Christian. That was my story. My rebellion came differently. My people-pleasing began to choke, robbing me of a lot of joy. 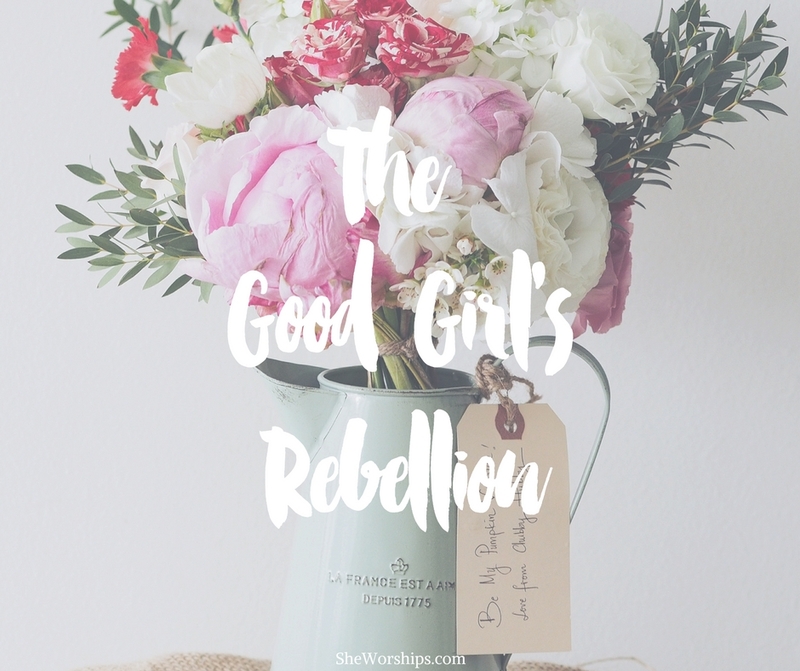 I was rebelling against grace because I didn’t realize I needed it–not on a deep down, honest-to-God level–and my spirit began to wither. I think this is common for a lot of kids raised in the church. It’s hard for us to see our sickness, because we look so good. But that’s one of the tell-tale signs of this subtle rebellion: how much you love your reputation, how much you love being a “good Christian,” and how committed you are to preserving that image. Another sign of this rebellion is how you take constructive criticism. If your response is to act indignant and complain, “I was only doing my best!” then that’s your rebellion. If your pride cannot admit weakness or humility, then you have effectively stiff-armed grace. I share all this, because I think there are a lot of “good girls” and “good guys” out there who are on this path, and they don’t even realize it. They are so good at being good, and that IS their separation from God. That’s the thing about rebellion. It takes a lot of forms, but its destination is always the same. It quietly siphons off our peace, steals our joy, and most surprisingly, it cripples our witness. After all, how can we speak convincingly about grace, if our knowledge is mostly hypothetical? For me, I had to realize how much I had become a slave to being liked. The good Christian image had become my master, and once I could see that, I realized my brokenness. We humans will literally make an idol out of anything, and for some, our idolatry is obvious. For others, it looks like a good Christian life. But for all of us, we desperately need the grace of Christ to save us from it. The sooner we can declare that truth, and mean it, the sooner we’ll be free. This convicted me so much. I was the good kid growing up, and underneath all that was hiding sin and trying to get through life with the best of both worlds. Thank you for sharing! Yes, I’m so the elder brother too. I am always moved by how the Father goes to meet his boys in a lavish display of grace, disregard for others’ watching, and appropriate to each one’s needs. Thanks so much for this. Beautiful. Thanks for sharing. I often have to check myself in the face of constructive criticism – quick excuses are my crutch, but I need to be open and truly listen to what is said. I replied to your post and was just about done and i must have hit a wrong button or something and i lost it. I dont know if it was deleted but i cant find it to finish it but i am not going to remember all i wrote so i guess i move on from here. Enjoyed reading your post. Very helpful. Makes one think. This post spoke to me and made me think about how I respond to grace and criticism. Thank you so much for sharing this bc it’s not talked about enough! So relatable!